The program I am currently working on is intended to be a database to record details of the digs I go on and my finds. The main record is the site of the dig with address information, site details, site history etc together with scanned images of the site plus GPS location and route information. 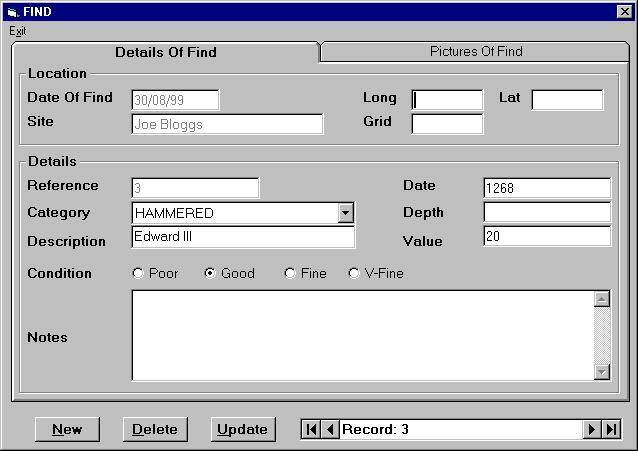 On each visit to the site, a visit record is created containing such information as weather, who went etc together with more scanned images of the visit. Attached to each visit record are the finds themselves. This records the category of the find, its value, description, condition, age, depth etc plus again GPS location and scanned images of the find. Searching facilities are available and it is very easy to perform a search of 'Hammered' coins dated between 1300 and 1500 valued at more than £25, for example. The program can also generate reports from the information in the database which can be previewed on screen, printed out, exported to disc or e-mailed out. The software isn't finished yet but is at the stage where is can be used to start recording finds. I have still got things to add but if anyone is interested, they can download a copy of what I have so far and try it out. You can download the user manual here (45k). It is in Word 95 format. You can download the software here (7.3Mb). Just run the SETUP program to install the software. 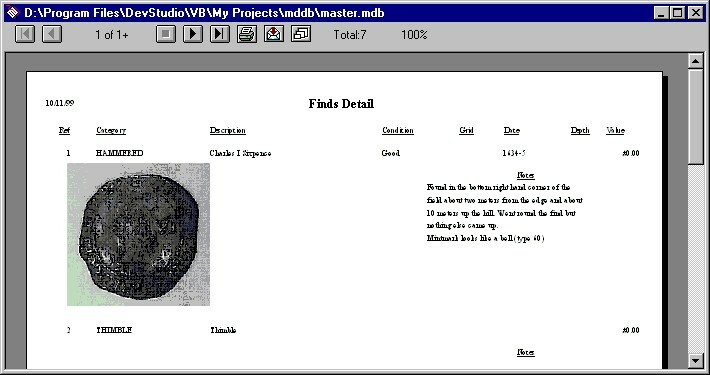 The file is quite large as it has to contain all the run time libraries for Visual Basic 5 and Crystal Reports. If you think you already have these libraries on your system, you can try downloading the smaller file here (630K) which only contains the program files. Run SETUP1 to install this version. If you get errors when running the program, you will have to download the full version. If you get any problems or have comments to make, please let me know. Several users have asked how they can make a donation to show their appreciation for making the detecting database software available free of charge. If you would like to help support this and future upgrades of the software, you can make a donation via PayPal by clicking on the button below. 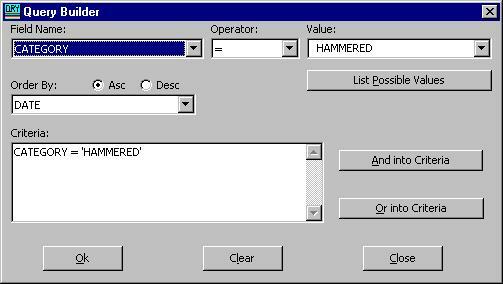 I have been informed that trying to generate a report on computers running Win95/98 can produce an 'Unable to Initialise OLE' type error. 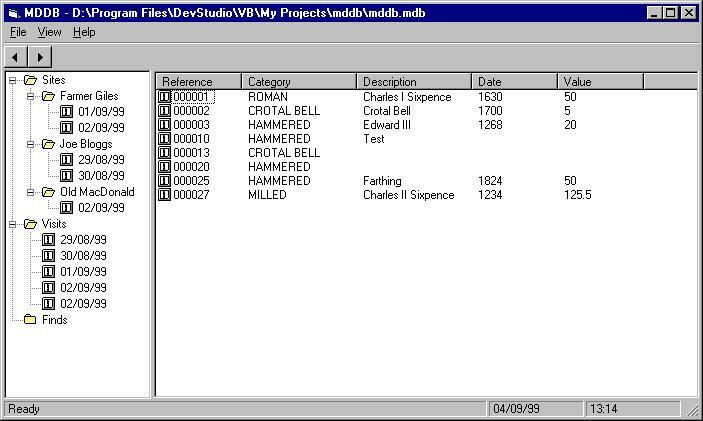 This has been tracked down to an out of date dll in the original installation files (works OK under NT by the way). If you have already downloaded the program and come across this error, you can download the newer dll's here (160K). Just unzip the file into your windows\system directory to replace four files with more up to date ones. The current installation files have been modified to include the new dll files. Sorry for this inconvenience. Use Windows Explorer to browse to the directory where you downloaded the SETUP.EXE file. Sorry for this inconvenience, it will be corrected in the next release.